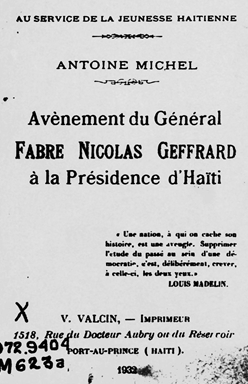 An excerpt from Michel’s Avènement du général Fabre Nicolas Geffrard à la présidence d’Haïti (1932). Michel was a Haitian intellectual and historian. Like Louis Joseph Janvier, he was a noiriste who believed that mulattos such as Fabre Geffrard had exploited blacks like Faustin Soulouque throughout Haitian history. With bitter resentment, Michel described how Geffrard and his lieutenant, Fils-Aimé, betrayed Soulouque and seized power. Keeping in mind the favors that the emperor [Soulouque] and the empress had bestowed on him, President Geffrard promised that nothing bad would happen to him or to any member of his family. Geffrard told General Fils-Aimé that he was responsible for Soulouque and that not a hair on his head should be harmed. 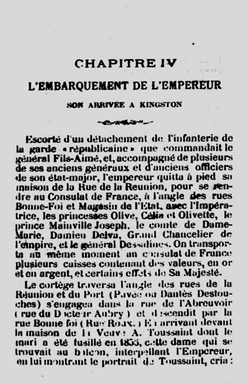 Acting on General Fabre Geffrard’s orders, General Fils-Aimé went to the French consulate to deliver [Soulouque’s] letter of abdication. Probably written by D[amien] Delva, the emperor signed it…. This is what the letter of abdication said: "Haitians, called on by the will of the people to lead the destiny of Haiti, all my concerns, all my strength has always served the welfare of my citizens and the prosperity of my country. I hoped to be able to count on the affection of those who elevated me to supreme power, but the latest events that have come to pass leave no doubt about the true sentiments of my citizens. I am too loyal to my country to hesitate and sacrifice everyone’s best interests, I believe that I must resign the high functions that I have assumed. I abdicate and my only wish is that Haiti will be as happy has my heart has always desired." General Fabre Geffrard went to the church to attend the Te-Deum…. He announced a speech that explained the goal and principles of the revolution. Following the religious ceremony, he toured the city, where some houses were decked with white flags. He then returned to the imperial palace.